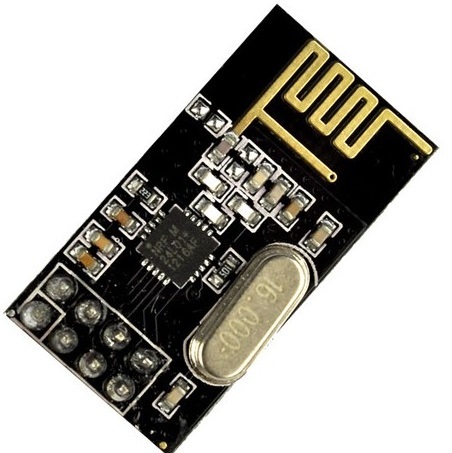 The NRF24L01 is a simple radio. One can use it to send and receive messages of 1...32 bytes in size. This message size is dynamic. It has 6 channels of which one can be used to transmit messages to (pipe 0). That is: you configure pipe 0 with the address you want to send to, pipe 1...5 are the addresses you receive messages on. Note: only the LSB (least significant byte) of pipe 1...5 can be different, the other part of the addresses must be the same. Pipe 0 can be anything. I found this page really useful for connection details. I had lots of problems getting it to work. No data was received at all or only for a short time. What follows is a list of things I find are required(?) to get it to work in my situation (arduinos distributed through my not that big house). Greg Copeland's library is the most convenient, flexible and works best. try to find a channel that is not used by anything else. for this you can for example use a WiSpy or any other 2.4GHz wifi frequency analyzer (it uses the same frequency band). note that the wifi channel numbers do not directly map to the ones of the NRF24L01. if you have an NRF24L01 with a external antenna (not a pcb antenna (the wiggly line at the top)) you can consider connecting a larger antenna to it. I connected regular wifi antennas. after transmitting data, add a "delay(5)"